Photo by Rachel Frey. 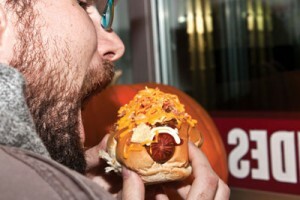 Mike Mckiel prepares to sink his teeth into an A-bomb, a hot dog topped with mustard, mayo, ketchup, bacon, cheese and BBQ potato chips which can be found at Tubby Dog. Have you sampled all that Wyckham House has to offer? Exhausted the options in the Herb ‘n’ Market? Eaten so many of those pre-packaged Sodexo sandwiches that they’ve been informally named after you? Don’t fret, weary diner – this list details some of the best independent eateries that are only a quick drive from campus, and which serve delicious meals that won’t break the bank. $1 – $5: Sarcee Bakery 4604 37th St. S.W. Sarcee Bakery is less than five minutes away from MRU by foot, and they have some delicious goodies on offer. But, this tiny bakery also has an even tinier lunch counter that’s serving up paninis for $4.85 and yummy homemade soup for $3.95. Better still, MRU students get a 10 per cent discount on lunch counter items if they show their student cards. VietSub Express 1619 37th St. S.W. VietSub Express is the new counterpart of Pho Huong Viet, which is just around the corner on 17th Avenue S.W. As the name would suggest, this place is more focused on the lunchtime sandwich crowd, and you can get a large sub and a can of pop for $5. Their pho is decent, but sate subs are where they shine: they come on a big baguette and are loaded with meat, lightly pickled carrots, cucumber, cilantro, onions and jalapenos. $6 – $10: Heritage Bakery & Deli 1912 37th St. S.W. I originally intended to put Heritage in the lowest price category, but I discovered their $5 lunch special is available only on Mondays. I forgave them when I tasted their cabbage rolls. $8.95 gets you two cabbage rolls and six perogies topped with a few dollops of sour cream, just like grandma used to make — if your grandma was Eastern European and a really good cook. They had some other stuff available as well, including a tempting breakfast special that allows you to choose four items for $6.95. Holy Grill 827 10th Ave. S.W. Holy Grill was recommended to me by Crystal Henrickson via Yelp.ca, who said she was “impressed by their big $8 paninis,” adding that “with the smiling service you get, it’s hard to go wrong.” I checked it out, and I definitely agree. Holy Grill is what fast food should be: quick and cheap, with generous portions and fresh, tasty ingredients. They don’t shy away from using veggies like avocados and artichokes, and there’s nary a processed cheese slice in sight. Also, Holy Grill’s hip downtown vibe scores them ambiance points, something many other places listed here are lacking. Little Lebanon 3515 17th Ave. S.W. Little Lebanon is a little place tucked away in a strip mall that offers shawarma, flatbreads and tabouleh, kosher/halal style. Though the flatbreads for under $5 were tempting, I had to choose the large donair for $8. It’s a very generous portion of donair beef topped with veggies and pickles, with either sweet or garlic sauce. Tubby Dog 1022 17th Ave. S.W. You’ve probably heard of Tubby Dog, but I would be remiss if I didn’t mention it anyway. It was recommended by Mike Mckiel, who recently tried it for the first time and became an instant fan. “The tubby chips are awesome,” he said. “$4.50 for a whole tray of the best fries ever.” My personal favourite is the A-Bomb dog, but those of you with more “adventurous” palates may enjoy the PBJ: a hot dog slathered in peanut butter and jelly, topped with a handful of Cap’n Crunch. $11 – $15: Moughal Mahal 2711 17th Ave. S.W. Moughal Mahal is a little hole-in-the-wall style place with a slightly dubious decorating scheme, but the food more than makes up for it. Admittedly, a typical dinner here would probably not be less than $15; however, they still make the list because Wednesday to Friday they offer a really tasty lunch buffet for $10.95. Typically this consists of rice, a vegetable or lentil dish, spicy beef meatballs and butter chicken to die for, along with big fluffy pieces of fresh naan bread. Chianti Cafe 1438 17th Ave. S.W. Chianti is an Italian restaurant with lots of great options for pasta, which is only $7.99 on Sunday, Monday and Tuesday. I put it in the higher price category though, because when you’re eating a huge plate of pasta it’s nice to have something to wash it down. Vanessa Oakley recommended Chianti because she has a gluten allergy, and they can substitute gluten-free pasta for $2 more. (People with Celiac disease, rejoice!) Her favourite is Carciofi Diabloe, rice pasta with chicken, artichokes, red peppers and spinach in a spicy basil cream sauce. Tucked away in a forest of slot machines in the Grey Eagle is the entrance to a cavernous buffet restaurant and, unlike most big buffets, the food in there is actually pretty good. There’s something for everyone, including an omelette bar, salad bar and probably more than 30 different dessert options. It really defies explanation, especially considering it’s all- you-can-eat for $12 to $15.